Background Clostridium difficile mediates intestinal inflammation by releasing toxin A (TxA), a potent enterotoxin. Cathelicidins (Camp as gene name, LL-37 peptide in humans and mCRAMP peptide in mice) are antibacterial peptides that also posses anti-inflammatory properties. Objectives To determine the role of cathelicidins in models of Clostridium difficile infection and TxA-mediated ileal inflammation and cultured human primary monocytes. Design Wild-type (WT) and mCRAMP-deficient (Camp−/−) mice were treated with an antibiotic mixture and infected orally with C difficile. Some mice were intracolonically given mCRAMP daily for 3 days. Ileal loops were also prepared in WT mice and treated with either saline or TxA and incubated for 4 h, while some TxA-treated loops were injected with mCRAMP. Results Intracolonic mCRAMP administration to C difficile-infected WT mice showed significantly reduced colonic histology damage, apoptosis, tissue myeloperoxidase (MPO) and tumour necrosis factor (TNF)α levels. Ileal mCRAMP treatment also significantly reduced histology damage, tissue apoptosis, MPO and TNFα levels in TxA-exposed ileal loops. 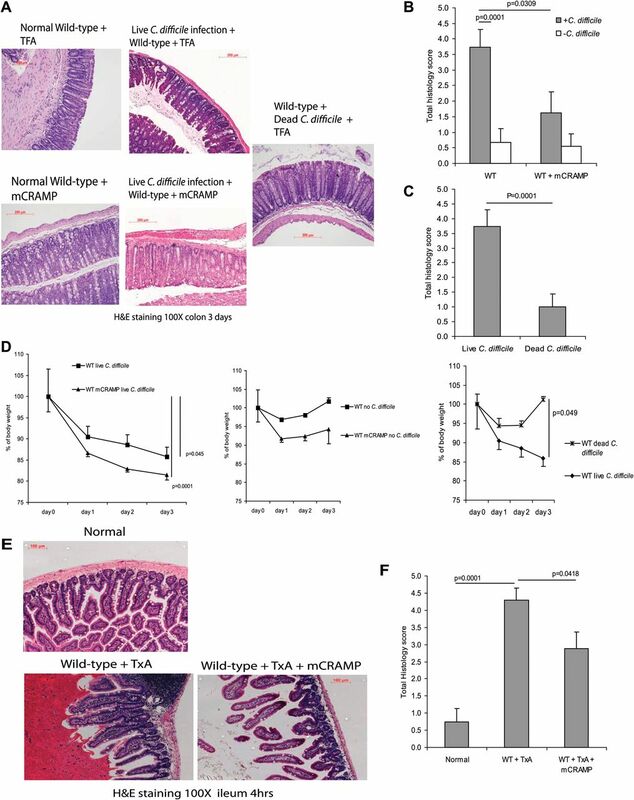 WT and Camp−/− mice exhibited similar intestinal responses in both models, implying that C difficile/TxA-induced endogenous cathelicidin may be insufficient to modulate C difficile/TxA-mediated intestinal inflammation. Both LL-37 and mCRAMP also significantly reduced TxA-induced TNFα secretion via inhibition of NF-κB phosphorylation. Endogenous cathelicidin failed to control C difficile and/or toxin A-mediated inflammation and even intestinal cathelicidin expression was increased in humans and mice. Conclusion Exogenous cathelicidin modulates C difficile colitis by inhibiting TxA-associated intestinal inflammation. Cathelicidin administration may be a new anti-inflammatory treatment for C difficile toxin-associated disease. C difficile causes serious nosocomial intestinal infection due to its proinflammatory entertoxins: toxin A and toxin B.
Tumour necrosis factor (TNF)α is an important proinflammatory mediator during colitis. Antimicrobial peptide cathelicidin has anti-inflammatory effects in a model of experimental colitis but its mechanism is not known. Cathelicidin significantly reduces C difficile-mediated colitis and toxin A-mediated enteritis. Cathelicidin reduces toxin A-induced TNFα expression in monocytes/macrophages via inhibition of NF-κB activity. Endogenous cathelicidin expression is increased during C difficile infection in human and mice. Increased endogenous cathelicidin expression fails to modulate the course of intestinal inflammation. Cathelicidin can be a new therapeutic anti-inflammatory reagent against the C difficile-mediated and toxin A-mediated inflammatory responses. Cathelicidins are a family of genes that encode peptides with antimicrobial activity. In humans the 37 amino acid LL-37 is the major cathelicidin peptide derived from the gene CAMP, whereas in mice the homologous peptide mCRAMP serves similar functions as the human LL-37.14 ,15 Administration of LL-37 to rats prevents death caused by Gram-negative bacteria.16 Low plasma LL-37 levels are also associated with increased infection and mortality in patients undergoing renal haemodialysis,16 suggesting that these peptides have an important role in preventing infection. In the intestine, cathelicidins are expressed in several cell types, including intestinal epithelial cells and macrophages.17 We have previously reported increased cathelicidin expression in the inflamed colonic mucosa of mice with sodium dextran sulphate (DSS)-induced colitis.18 We also showed that endogenous cathelicidin can modulate DSS-mediated intestinal inflammation using cathelicidin mCRAMP-deficient (Camp−/−) mice,18 while Tai et al reported that intracolonic mCRAMP administration ameliorates colitis in wild-type mice exposed to DSS.19 Previous studies suggested that the human cathelicidin LL-37 can modulate inflammation by directly altering cellular responses related to innate immunity, such as production of cytokines and chemokines.20 However, there are no studies examining the immunomodulatory effects of LL-37 or mCRAMP in C difficile infection and no evidence exists that these antimicrobial peptides can modulate C difficile toxin-induced intestinal inflammation. In this study, we examined the effects of cathelicidin on modulating toxin A-mediated enteritis and C difficile toxin-associated colitis using in vivo mouse models and in vitro primary human monocytes and mouse macrophages. We found that exogenous cathelicidin significantly reduces tissue damage and inflammation caused by C difficile infection and toxin A. We also report that cathelicidin decreases toxin A-mediated TNFα expression in monocytes by inhibiting activation of the NF-κB pathway in response to toxin A. A breeding colony of mCRAMP-deficient (Camp−/−) mice was established and maintained at the University of California, Los Angeles (UCLA) animal facility under standard conditions. Mice received standard pelleted chow and tap water freely. Eight to 12-week-old wild-type (WT) and Camp−/− mice in C57/BL6 background were anaesthetised with isoflurane. Ileal loops (2–3 cm) were formed by tying up with surgical sutures. Toxin A (10 μg/loop) and/or mCRAMP (50 nmol) in saline (total volume 200 μl per loop) was injected into ileal loops, as previously described.23 The concentration of mCRAMP in ileal loop treatment is equivalent to 10 mg/kg, previously shown to successfully ameliorate DSS-induced colitis in mice.19 The abdomen was sealed by surgical sutures and wound clips, and the mice were returned to consciousness. After 4 h mice were euthanised and ileal tissues were obtained for further analyses. Animal studies were approved by the institutional animal research committee of UCLA. Wild-type or Camp−/− mice had an antibiotic cocktail added to their drinking water (from day −6 to day −3), as previously described.21 Mice were then switched to regular drinking water thereafter. On day −1, mice were injected with clindamycin intraperitoneally, followed by C difficile challenge (105 colony-forming units) by oral gavage. Some mice were given mCRAMP (5 mg/kg) intracolonically once a day from day 0 to day 2. Mouse colons were obtained on day +3 for further analyses. C difficile infection resulted in mild diarrhoea without death. Human colonic biopsy specimens from normal and C difficile-infected patients were obtained after informed consent in accordance with procedures established by the Beth Israel Deaconess Medical Center institutional review board. Details of patients' conditions, indications and drugs are shown in online supplementary patient data. To assess the potential role of cathelicidin in C difficile-associated colitis, we infected C57/BL6 WT mice with C difficile by oral gavage to induce colitis, as described in the ‘Materials and methods’ section. Three days after C difficile inoculation, mice developed colitis with altered mucosal architecture, neutrophil infiltration and oedema as reflected by haematoxylin and eosin staining and histology score (p=0.0001 compared with the mice without C difficile infection, figure 1A–C). C difficile-infected mice had a sustained body weight loss that was statistically significant (p=0.045) in comparison with groups without C difficile infection (figure 1D). Death or colonic haemorrhage was not seen after C difficile infection. Administration of exogenous cathelicidin significantly reduced C difficile colitis in WT mice (p=0.0309) as reflected by the histology score (figure 1A,B). Mice inoculated with heat-inactivated C difficile did not exhibit any signs of colitis, as shown by the lack of change in histology scores and no significant loss of body weight (figure 1A,C and D). Exogenous cathelicidin reduces C difficile colitis and toxin A (TxA) enteritis in mice. (A) Haematoxylin and eosin (H&E) staining of colonic tissues of wild-type (WT) mice after exposure to C difficile and/or mCRAMP for 3 days. (B, C) Histology score of all groups. C difficile infection significantly increased total histology scores (p=0.0001) in comparison with groups without C difficile administration but was reduced by exogenous cathelicidin (p=0.0309 in wild-type mice). (D) Body weight of C difficile-treated groups had significant body weight loss from day 0 to day 3. Dead C difficile-treated mice did not develop colitis or body weight loss. (E) H&E staining of ileal tissues of wild-type and Camp−/− mice after exposure to toxin A and/or mCRAMP for 3 days. (F) Histology score of all groups. Toxin A significantly increased histology scores (p=0.0001) in comparison with groups without C difficile administration. mCRAMP administration significantly reduced the histology score in wild-type (p=0.0418) mice. Results are representative of five mice per group. TFA, tritluoraetic acid. We next used the toxin A ileal loop model to study the role of cathelicidin in toxin A-mediated enteritis in the mouse ileum (figure 1E,F). Toxin A administration, like C difficile infection, caused epithelial cell destruction, neutrophil infiltration and oedema as indicated by the histology score (p=0.0001) (figure 1E,F). Ileal administration of cathelicidin significantly decreased inflammation and ileal mucosal damage in toxin A-treated (p=0.0418) ileal loops as reflected by reduced total histology scores (figure 1E,F). The presence of additional cathelicidin in ileal tissues after exogenous cathelicidin administration is illustrated in supplementary figure 1D. Since cathelicidin reduces toxin A-induced tissue damage, we next determined the inflammatory activity of neutrophils using the MPO assay26 ,27 and found increased ileal MPO levels in toxin A-exposed loops (p=0.04, figure 2C). In contrast, administration of exogenous cathelicidin significantly reduced ileal MPO activity in the ileal loops of toxin A-treated mice (p=0.002) compared with groups that did not receive exogenous cathelicidin (figure 2C). Similarly, colons of mice infected with C difficile bacteria had substantially increased colonic MPO expression (p=0.0001), which was significantly reduced by administration of exogenous cathelicidin (p=0.0001, figure 2A). As expected, administration of heat-inactivated C difficile did not elicit MPO activation in mice colons (figure 2B). Exogenous cathelicidin inhibits C difficile/toxin A (TxA)-mediated myeloperoxidase (MPO) expression in intestine. (A and B) MPO expression of colonic tissues. (C) MPO expression of ileal tissues. Intestinal MPO expression was significantly increased in live but not dead C difficile-treated and toxin A-treated groups but were reduced by exogenous cathelicidin. Results are representative of five mice per group. WT, wild-type. Toxin A administration into ileal loops resulted in apoptosis of ileal mucosal cells (brown signal, figure 3B), confirming our earlier observations.6 C difficile infection also triggered colonic apoptosis (figure 3A), which was quantified by measurements of the apoptosis index (figure 3C,D). Exogenous cathelicidin administration significantly reduced C difficile-induced (p=0.0074) and toxin A-induced (p=0.0001) intestinal apoptosis (figures 3C,D). Since toxin A induces cell death in human colonic epithelial NCM460 cells,6 we examined whether LL-37 might alter this effect. Co-exposure of NCM460 cells to LL-37 (1–10 μM) and toxin A and toxin B did not alter toxin A/B-associated loss of cell viability (figure 3E) or toxin A-mediated PARP cleavage (figure 3F). Addition of LL-37 alone modestly increased cell viability (figure 3E). On the other hand, both LL-37 and mCRAMP (1–10 μM) were unable to alter loss of cell viability in human primary PBMCs and mouse RAW264.3 macrophages after exposure to toxins A and B (supplementary figure 6). These data indicate that the antiapoptotic effects of cathelicidin seen in the in vivo models of C difficile-associated intestinal inflammation are not due to direct protective effects of cathelicidin against C difficile toxins at the colonic epithelial cell level. Exogenous cathelicidin reduces toxin A-dependent intestinal apoptosis. (A and B) Apoptotic cells (indicated by black arrows) were stained brown but not black . (A) C difficile-infected colonic tissues. (B) Toxin A (TxA)-treated ileal tissues. (C, D) Apoptosis index of colonic and ileal tissues showing quantitative results of apoptosis observation. C difficile infection and toxin A treatment caused colonic apoptosis in mice (p=0.0001), which was significantly reduced by exogenous cathelicidin. Only live, but not dead, C difficile infection caused colonic apoptosis. Results are representative of five mice per group. (E) NCM460 cells were treated with toxin A and toxin B (5 μg/ml) and LL-37 (0–10 μM) for 48 h. Cell viability was measured by MTT assays. Toxin A and toxin B treatment significantly reduced viability of colonocytes but cathelicidin did not alter this effects. Cathelicidin alone modestly increase cell proliferation. (F) NCM460 cells were treated with saline of toxin A (5 μg/ml) with LL-37 (0–10 μM) for 24 h. Cleaved PARP and β-actin were detected by western blot analyses with quantification. 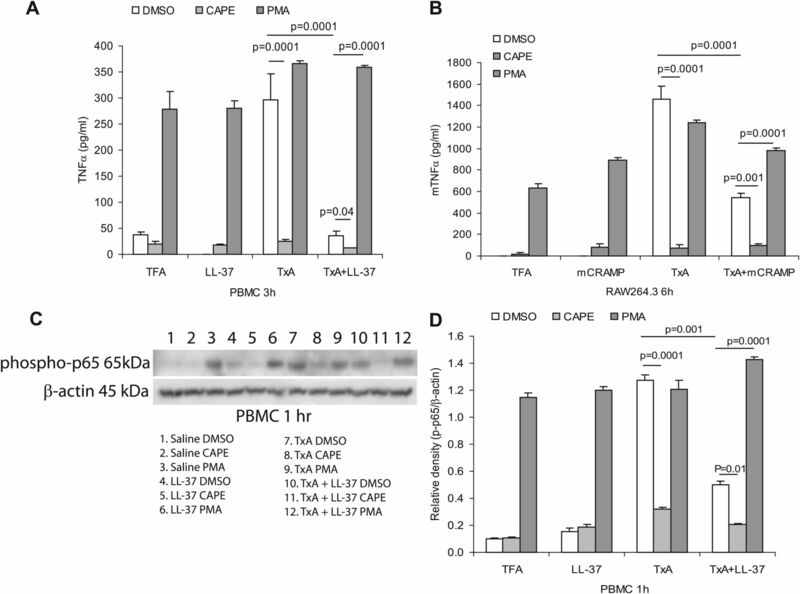 Cathelicidin did not alter toxin A-mediated proapoptotic PARP cleavage in colonocytes. Results are representative of three independent experiments. TFA, tritluoraetic acid; WT, wild-type. TNFα is associated with the proinflammatory effects of C difficile toxin A.25 As shown in figure 4A,B, C difficile infection (figure 4A) and ileal toxin A injection (figure 4B) increased TNFα protein levels in colonic and ileal tissues in mice (p=0.0001). Exogenous mCRAMP administration significantly reduced colonic TNFα levels (p=0.0001) in C difficile-infected mice (figure 4A). Furthermore, mCRAMP administration decreased toxin A-induced ileal TNFα protein expression (p=0.0001) compared with groups that did not receive exogenous cathelicidin (figure 4B). A similar finding was seen in ileal TNFα mRNA expression by real-time RT-PCR (figure 4C), further supporting the anti-inflammatory effects of exogenous cathelicidin. Exogenous cathelicidin reduces tumour necrosis factor (TNF)α expression in ileal and colonic inflammation. (A) TNFα protein in C difficile-treated colonic tissues. (B) TNFα protein and (C) TNFα mRNA in saline or toxin A (TxA)-treated ileal tissues. Toxin A significantly increased TNFα protein (p=0.0001) and TNFα mRNA (p=0.01) in wild-type (WT) mice. Exogenous mCRAMP reduces TNFα protein (p=0.0001) and TNFα mRNA (p=0.04), respectively. Results are representative of five mice per group. (D) TNFα protein and (E) TNFα mRNA expression in toxin A (5 μg/ml) and LL-37 treated peripheral blood mononuclear cells (PBMCs). LL-37 (5 μM and 10 μM) significantly reduced toxin A (5 μg/ml)-induced TNFα expression. (F) Mouse TNFα protein expression in toxin A (5 μg/ml) and mCRAMP-treated mouse macrophages. mCRAMP (1–10 μM) significantly reduced toxin A-induced TNFα. Results are representative of three independent experiments. TFA, tritluoraetic acid. TNFα is commonly expressed in a wide range of cells including monocytes and macrophages and is associated with the proinflammatory responses to C difficile toxin A.25 ,28 As shown in figure 4D, addition of LL-37 (5–10 μM) to human PBMCs for 3 h reduced toxin A-induced TNFα expression in a concentration-dependent manner, with 5 μM (p=0.03) and 10 μM (p=0.002) yielding maximal TNFα suppression. Similarly, LL-37 also significantly reduced toxin A- and toxin B-mediated TNFα mRNA expression in human monocytes (figure 4E and supplementary 1B). Toxin A significantly induced TNFα mRNA expression (p=0.0001) in mouse RAW264.3 macrophages (supplementary figure 1C). The mouse cathelicidin mCRAMP also significantly suppressed toxin A-induced TNFα protein expression (p=0.0001) in mouse RAW264.3 macrophages (figure 4F). LL-37 or mCRAMP alone had no significant effect on TNFα expression in human monocytes and mouse macrophages in the absence of toxin A (figure 4D,F). Since toxin B is also involved in the pathophysiology of C difficile infection,23 ,29 we examined the effect of cathelicidins in toxin B-induced TNFα expression. Toxin B caused a modest, but statistically significant increase (p=0.0437) in TNFα protein levels in PBMCs that was significantly minimised with 5–10 μM LL-37 (p=0.02) in PBMCs (supplementary figure 1A). C difficile alone is only a weak inducer of TNFα in both human monocytes and NCM460 colonocytes (supplementary figure 4C,D). Moreover, neither toxin A or toxin B could stimulate TNFα secretion in human NCM460 colonic epithelial cells (supplementary figure 5A,B). Previous studies demonstrated an important role for NF-κB in mediating TNFα expression30 and the toxin A-mediated NF-κB activation.11 To investigate whether NF-κB can regulate toxin A-mediated TNFα expression, we pretreated primary human monocytes or mouse macrophages with the NF-κB inhibitor caffeic acid phenethyl ester (CAPE) and the NF-κB activator phorbol myristate acetate (PMA), followed by toxin A and LL-37/mCRAMP (5 μM) treatment. As shown in figure 5A,B, toxin A increased TNFα expression in human PBMCs or mouse RAW264.3 macrophages and this effect was partially reversed by co-exposure with LL-37, mCRAMP or CAPE. Alternatively, activation of NF-κB by PMA activated TNFα expression and also reversed the inhibitory effects of LL-37 or mCRAMP in toxin A-induced TNFα expression (figure 5A,B). To determine NF-κB activity in the inhibitory responses of cathelicidin, western blot analysis using an antibody against the phosphorylated p65 subunit of NF-κB was performed. LL-37 reduced the strong phospho-p65 protein signal in toxin A-treated PBMCs (figure 5C). A similar trend was also seen in PBMCs exposed to the NF-κB inhibitor CAPE, whereas an enhanced signal was seen in PMA-treated PBMCs (figure 5C,D). Two control groups, saline and LL-37 alone, showed a weak basal phospho-p65 signal in demethyl sulphoxide-treated groups (figure 5C,D). Together, these results suggest that toxin A induces TNFα expression in an NF-κB-dependent manner. Cathelicidin suppresses NF-κB activity leading to reduced toxin A-induced TNFα expression. LL-37 inhibits toxin A (TxA)-induced tumour necrosis factor (TNF)α expression in monocytes via inhibition of NF-κB. (A) Peripheral blood mononuclear cells (PBMCs) were pretreated with vehicle demethyl sulfoxide (DMSO), NF-κB inhibitor caffeic acid phenethyl ester (CAPE) (10 μM) and NF-κB activator phorbol myristate acetate (PMA; 1 μM) for 30 min, followed by toxin A (5 μg/ml) and/or LL-37 (5 μM) for 3 h. CAPE inhibited toxin A-induced TNFα protein expression (p=0.0001) and further augmented the inhibitory effects of LL-37 (p=0.04) which was reversed by PMA (p=0.0001). (B) Mouse Raw264.3 macrophages were pretreated with vehicle demethyl sulphoxide (DMSO), NF-κB inhibitor caffeic acid phenethyl ester (CAPE) (10 μM) and NF-κB activator phorbol myristate acetate (PMA) (1 μM) for 30 min, followed by toxin A (5 μg/ml) and/or mCRAMP (5 μM) for 6 h. CAPE inhibited toxin A-induced TNFα protein expression (p=0.0001) and further augmented the inhibitory effects of mCRAMP (p=0.001) which was reversed by PMA (p=0.0001). (C and D) PBMCs were pretreated with vehicle DMSO, NF-κB inhibitor CAPE (10 μM) and NF-κB activator PMA (1 μM) for 30 min, followed by toxin A (5 μg/ml) and/or LL-37 (5 μM) for 1 h. Phospho-NF-κB p65 subunit and β-actin were determined by western blot analyses (C) with quantification of band intensity (D). CAPE inhibited toxin A-induced TNFα protein expression (p=0.0001) and further augmented the inhibitory effects of LL-37 (p=0.01) which was reversed by PMA (p=0.0001). Results are representative of three independent experiments. TFA, tritluoraetic acid. To corroborate our in vitro findings, we determined whether cathelicidin has a similar anti-inflammatory role in C difficile- and toxin A-induced ileitis using in vivo models. Examination of colonic tissues from mice exposed to C difficile bacteria, or mouse ileal loops exposed to toxin A, showed increased phospho-p65 expression (dark arrows, figure 6A,B), compared with control tissues where phospho-p65 expression is low. Quantification of the phospho-p65 signal showed a significant increase in phospho-p65 positive cells in C difficile/toxin A-exposed mice (C difficile p=0.001, toxin A p=0.0198) compared with the control (figure 6C,E). Moreover, exposure of mice to heat-inactivated C difficile did not induce p65 phosphorylation (figure 6D). Exogenous administration of cathelicidin to mice significantly diminished phospho-p65 expression in response to C difficile bacteria (p=0.0024) and toxin A ileal administration (p=0.004) (figure 6C,E). Exogenous cathelicidin reduces NF-κB p65 phosphorylation in macrophages of toxin A (TxA)-treated ileal tissue. (A, B) Immunohistochemistry of phospho-p65 of colonic and ileal tissues. (C–E) Quantification of phospho-p65 signal. C difficile/toxin A significantly increased phospho-p65-positive cells in colonic/ileal tissues (p=0.0001 and p=0.0198), which was significantly reduced by exogenous mCRAMP in (p=0.0024 and p=0.004) wild-type (WT) mice. Administration of dead C difficile did not trigger colonic p65 phosphorylation. Results are representative of five mice per group. TFA, tritluoraetic acid. To study the role of endogenous cathelicidin in the development of C difficile infection and toxin A enteritis, we measured the mouse intestinal cathelicidin (Camp) expression of mice. Administration of C difficile to mice significantly induced colonic Camp mRNA expression by ∼2.2 fold (p=0.0001) (figure 7A). Heat-inactivated C difficile did not affect basal Camp mRNA level in colons (figure 7A). Compared with saline control, ileal toxin A administration significantly induced Camp mRNA (by ∼3.9 fold, p=0.02) and protein (∼2.5 fold, p=0.005) in the ileal mucosa, respectively (figure 7B,C). Moreover, examination of colonic tissues from C difficile-infected patients showed increased expression of colonic cathelicidin compared with colonic tissues from uninfected subjects (figure 7D). Details of each patient's condition are shown in the supplementary patient data. Endogenous cathelicidin does not modulate C difficile/toxin A (TxA)-mediated inflammation. (A) Colonic cathelicidin Camp mRNA expression after exposure to C difficile. (B) Ileal Camp mRNA and (C) mCRAMP protein expression (by western blot) with quantification after exposure to toxin A. Live C difficile (p=0.0001) and toxin A triggered significant increase of Camp mRNA (p=0.02) and/or protein (p=0.005) in colons and ileum, respectively. Results are representative of five mice per group. (D) Colonic cathelicidin immunohistochemistry of four uninfected and four C difficile-infected patients. Cathelicidin expression is mildly increased in C difficile-infected patients, compared with normal patients. (E) Haematoxylin and eosin (H&E) staining and histology scores of C difficile-infected colons in wild-type and Camp−/− mice. (F) H&E staining and histology scores of toxin A-treated ileum in wild-type (WT) and Camp−/− mice. Both WT and Camp−/− mice developed a similar extent of histological damage in response to C difficile or toxin A but exogenous cathelicidin significantly reduced histological damage in both models (p=0.03; p=0.0381). Results are representative of five mice per group. We next compared colonic inflammatory changes between WT and Camp−/− mice in response to C difficile infection. No difference in histological damage following C difficile infection was found (figure 7E). 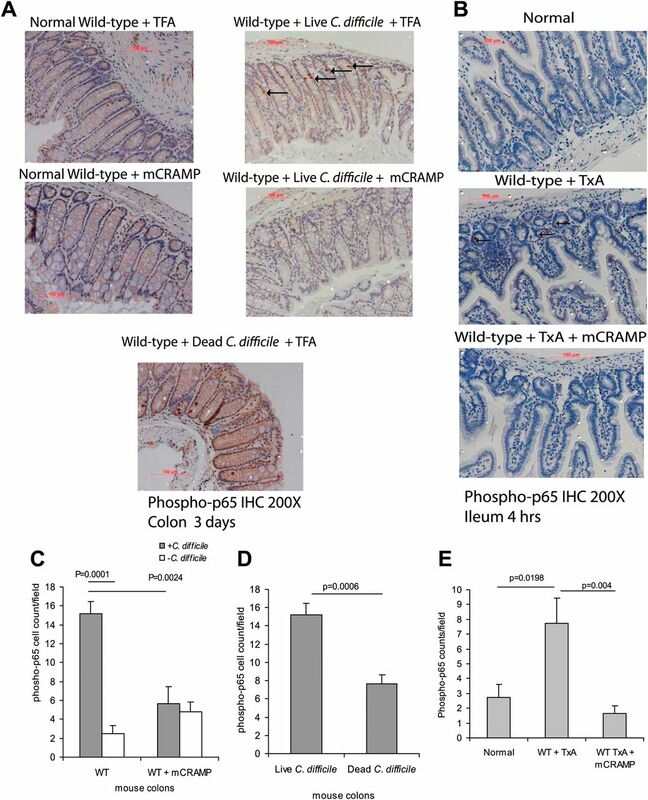 Weight loss, TUNEL apoptosis index, TNFα and phosphorylated p65 levels were similar in C difficile-exposed WT and Camp−/− mice (supplementary figures 2 and 3). Similarly, no difference in ileal histology scores (figure 7F), TUNEL apoptosis index, TNFα and phosphorylated p65 levels between toxin A-injected WT and Camp−/− mice were found (supplementary figures 2 and 3). These results indicate that upregulation of intestinal endogenous cathelicidin Camp may have limited role in modulating the development of intestinal inflammation caused by toxigenic C difficile or toxin A. 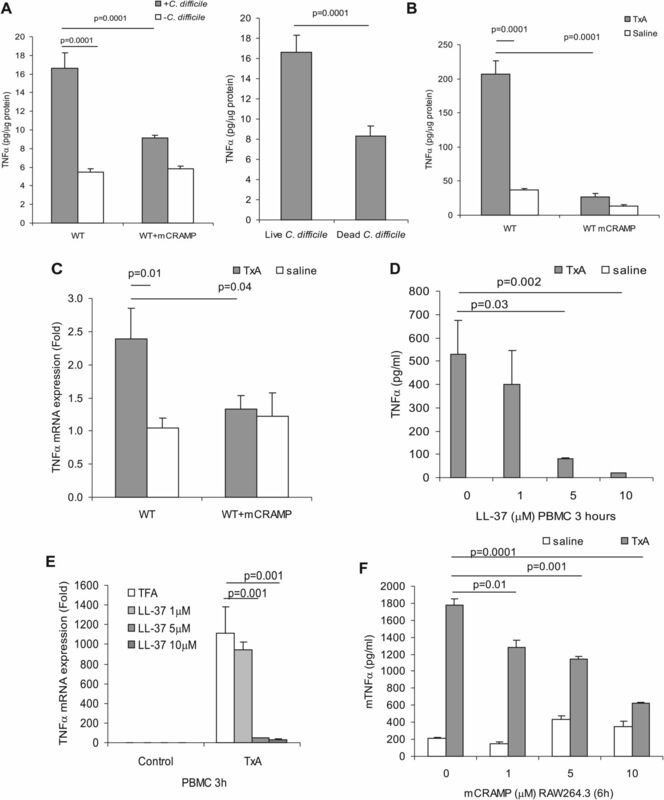 However, exogenous cathelicidin (mCRAMP) administration exerts significant anti-inflammatory effects to Camp−/− mice and in WT mice in both the C difficile infection and toxin A enteritis models, including reductions in histological inflammation (7E,F), apoptosis (supplementary figure 2B,C), intestinal TNFα levels (supplementary figure 2D,E) and intestinal NF-κB p65 phosphorylation (supplementary figure 3). Our study illustrates an important role for the antimicrobial peptide cathelicidin in the inhibition of C difficile-mediated intestinal inflammation. We demonstrate that intracolonic cathelicidin administration significantly reduces tissue damage and inflammatory responses in C difficile colitis in mice. In addition, intraluminal cathelicidin administration reduces the intestinal inflammation in response to C difficile toxin A, an important enterotoxin involved in the pathophysiology of C difficile infection. The anti-inflammatory effects of cathelicidins involve inhibition of NF-κB activity and TNFα expression in response to toxin A and/or toxin B (figures 4⇑–6), leading to diminished mucosal apoptosis, neutrophil infiltration and congestion and oedema seen in our in vivo models (figure 1). To our knowledge, our report is the first to demonstrate an important role for cathelicidin in innate immune responses associated with a bacterial exotoxin, such as C difficile toxin A. Although cathelicidin is known to possess antimicrobial properties, we found that cathelicidin LL-37 (10 μM) had mildly reduced C difficile viability of up to 13% while mCRAMP (up to 10 μM) had no significant antibacterial effects against C difficile (supplementary figure 4A,B). Thus, the therapeutic value of cathelicidin shown in our studies is likely to depend on its anti-inflammatory effects against the actions of toxin A and toxin B in the gut mucosa. It has been shown that cathelicidin can neutralise Toll-like receptor 4 ligand endotoxin lipopolysaccharide-associated sepsis,31 while it also forms a complex with bacterial DNA and influences Toll-like receptor 9-mediated proinflammatory activity in psoriasis.32 Our data show that the anti-inflammatory effect of cathelicidin is mediated by inhibition of toxin A-induced NF-κB activity. Although it is known that gp96 can serve as a toxin A-binding protein in HT29 colonocytes,33 gp96 is just one of many protein molecules in the colonocyte membrane that co-immunoprecipitate with toxin A.33 Thus, it is difficult to determine the potential interactions between cathelicidin and toxin A/B until the specific receptors of toxin A and B are fully characterised. Although cathelicidin expression is increased in C difficile infection in mice and humans (figure 7A–D), Camp−/− mice had similar degree of C difficile colitis and toxin A-induced enteritis in vivo (figure 7E,F), suggesting that endogenous cathelicidin may not play a significant role in mediating C difficile toxin A-associated intestinal inflammation. Our previous study, however, showed that Camp−/− mice developed more severe colitis than WT mice in the DSS-mediated mouse model of acute colitis.18 The pathophysiological mechanism of C difficile infection may be different from that of inflammatory bowel disease, which is dependent on abnormal interactions between the host and microbiota.37 ,38 We speculate that different mechanisms of inflammation between these models (C difficile, toxin A and DSS) may account for the different in vivo responses. Consistent with our findings in this report, experiments with Camp−/− mice showed that endogenous cathelicidin does not provide protection in other infections or toxin challenges, such as in fungal infection with Candida albicans39 or mortality associated with lipopolysaccharide injection.40 However, Camp−/− mice are as responsive to an anti-inflammatory dose of exogenous cathelicidin as WT mice (figure 7E,F, supplementary figures 2–3). For the histological staining we were assisted by the UCLA histology core facility at the Department of Pathology and Laboratory Medicine. Primary human monocytes were provided by Cedars-Sinai Inflammatory Bowel and Immunobiology Research Institute Tissue Repository Center, under IRB 3358. Biopsies of C difficile-infected patients were provided by the Department of Pathology of Beth Israel Deaconess Medical Center under IRB 2011P-000206 (exempt study of existing samples).
. Clostridium difficile–more difficult than ever. N Engl J Med 2008;359:1932–40.
. The role of toxin A and toxin B in Clostridium difficile infection. Nature 2010;467:711–13.
. Clostridium difficile infection. Annu Rev Med 1998;49:375–90.
. Rho/Ras-GTPase-dependent and—independent activity of clostridial glucosylating toxins. J Med Microbiol 2011;60:1057–69.
. Clostridium difficile toxin A decreases acetylation of tubulin, leading to microtubule depolymerization through activation of histone deacetylase 6 and this mediates acute inflammation. J Biol Chem 2010;285:32888–96.
. Inflammation and apoptosis in Clostridium difficile enteritis is mediated by PGE2 up-regulation of Fas ligand. Gastroenterology 2007;133:875–86.
. Clostridium difficile toxin A perturbs cytoskeletal structure and tight junction permeability of cultured human intestinal epithelial monolayers. J Clin Invest 1988;82:1516–24.
. Cytokine response by human monocytes to Clostridium difficile toxin A and toxin B. Infect Immun 1991;59:3659–66.
. Microbes and microbial toxins: paradigms for microbial-mucosal interactions II. The integrated response of the intestine to Clostridium difficile toxins. Am J Physiol Gastrointest Liver Physiol 2001;280:G178–83.
. Clostridium difficile toxin A induces the release of neutrophil chemotactic factors from rat peritoneal macrophages: role of interleukin-1beta, tumor necrosis factor alpha and leukotrienes. Infect Immun 1997;65:2740–6.
. Clostridium difficile toxin A triggers human colonocyte IL-8 release via mitochondrial oxygen radical generation. Gastroenterology 2002;122:1048–57.
. Saccharomyces boulardii inhibits ERK1/2 mitogen-activated protein kinase activation both in vitro and in vivo and protects against Clostridium difficile toxin A-induced enteritis. J Biol Chem 2006;281:24449–54.
. Treatment of Clostridium difficile-associated disease. Gastroenterology 2009;136:1899–912.
. LL-37, the only human member of the cathelicidin family of antimicrobial peptides. Biochim Biophys Acta 2006;1758:1408–25.
. Identification of CRAMP, a cathelin-related antimicrobial peptide expressed in the embryonic and adult mouse. J Biol Chem 1997;272:13088–93.
. Low plasma level of cathelicidin antimicrobial peptide (hCAP18) predicts increased infectious disease mortality in patients undergoing hemodialysis. Clin Infect Dis 2009;48:418–24.
. Epithelial antimicrobial peptides in host defense against infection. 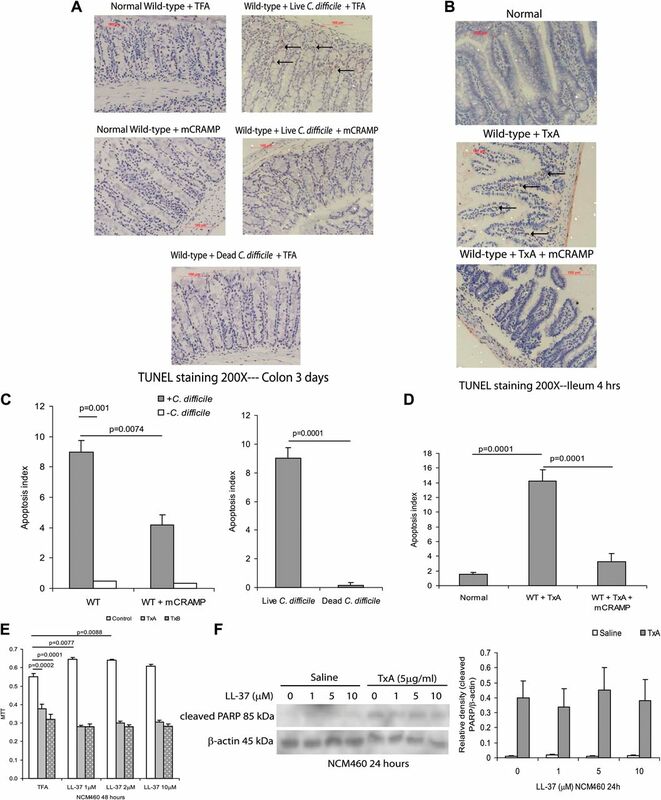 Respir Res 2000;1:141–50.
. Cathelicidin signaling via the Toll-like receptor protects against colitis in mice. Gastroenterology 2011;141: 1852–63.e1–3.
. A new role for cathelicidin in ulcerative colitis in mice. Exp Biol Med (Maywood) 2007;232:799–808.
. Immunomodulatory properties of defensins and cathelicidins. Curr Top Microbiol Immunol 2006;306:27–66.
. A mouse model of Clostridium difficile-associated disease. Gastroenterology 2008;135:1984–92.
. Clostridium difficile toxin B is an inflammatory enterotoxin in human intestine. Gastroenterology 2003;125: 413–20.
. Microbial induction of inflammatory bowel disease associated gene TL1A (TNFSF15) in antigen presenting cells. Eur J Immunol 2009;39:3239–50.
. Substance P mediates antiapoptotic responses in human colonocytes by Akt activation. Proc Natl Acad Sci U S A 2007;104:2013–18.
. IL-11 inhibits Clostridium difficile toxin A enterotoxicity in rat ileum. Am J Physiol 1997;273:G333–41.
. Effect of biotherapeutics on cyclosporin-induced Clostridium difficile infection in mice. J Gastroenterol Hepatol 2010;25: 832–8.
. Role of myeloperoxidase in the host defense against fungal infection. Nippon Ishinkin Gakkai Zasshi 2006;47:195–9.
. Essential role of the glucosyltransferase activity in Clostridium difficile toxin-induced secretion of TNF-alpha by macrophages. Microb Pathog 2009;46:298–305.
. Clostridium difficile toxin A-induced colonocyte apoptosis involves p53-dependent p21(WAF1/CIP1) induction via p38 mitogen-activated protein kinase. Gastroenterology 2005;129:1875–88.
. Tumor necrosis factor-alpha signaling in macrophages. Crit Rev Eukaryot Gene Expr 2010;20:87–103.
. Protective effects of a human 18-kilodalton cationic antimicrobial protein (CAP18)-derived peptide against murine endotoxemia. Infect Immun 1998;66:1861–8.
. Plasmacytoid dendritic cells sense self-DNA coupled with antimicrobial peptide. Nature 2007;449:564–9.
. Gp96 is a human colonocyte plasma membrane binding protein for Clostridium difficile toxin A. Infect Immun 2008;76:2862–71.
. Effect of Clostridium difficile toxin A on human intestinal epithelial cells: induction of interleukin 8 production and apoptosis after cell detachment. Gut 1996;38:337–47.
. Mechanism of Clostridium difficile toxin A-induced apoptosis in T84 cells. J Infect Dis 2002;186:1438–47.
. Human alpha-defensins inhibit Clostridium difficile toxin B. Gastroenterology 2008;134:2049–58.
. Defensins and cathelicidins in gastrointestinal infections. Curr Opin Gastroenterol 2007;23:32–8.
. Negative interactions with the microbiota: IBD. Adv Exp Med Biol 2008;635:67–78.
. Anti-fungal activity of cathelicidins and their potential role in Candida albicans skin infection. J Invest Dermatol 2005;125:108–15.
. Differing effects of exogenous or endogenous cathelicidin on macrophage toll-like receptor signaling. Immunol Cell Biol 2009;87:496–500.
. Clostridium difficile and inflammatory bowel disease. Inflamm Bowel Dis 2008;14:1432–42. TCH and SH share co-first authorship as they have equally contributed to this work. Funding This work was supported by a pilot and feasibility study grant (#29122) from the UCLA-CURE Center, a Crohn's and Colitis Foundation of America Research Fellowship (#1406) and a Career Development Award (#2691) and NIH K01 DK084256 grant to HWK. Support was also provided by the Blinder Research Foundation for Crohn's Disease, the Eli and Edythe Broad Chair (CP) and United States Public Health Service grant DK072471 (CP) and DK046763 (DQS and SRT). Ethics approval Cedars Sinai IRB and Beth Israel Deaconess Medical Center IRB. Data sharing statement We may share additional unpublished data from the study. Please contact Dr Hon Wai Koon of UCLA.